A skinny twenty-seven-year old, I pull a thick afghan onto my lap and ask my father to tell me about his childhood. He begins with the usual maneuvers: he adopts surliness, then he jokes, evades. By this time I am armed with the fledgling skills of a young therapist. I have learned a few in the craft of opening up a closed heart. “You know, your mother and I deliberately made the decision to keep this from you,” he begins. He pauses. “You’ll never know what it was like back then,” he tells me, “the Depression..” He lapses into silence for a while and then he begins. He wasn’t more than six or seven when his mother died of some lingering disease. He had only vague pictures of her in his head, hardly any memories he recalled her warmth, an infectious laugh. After she died, things went downhill for my father’s father, Abe, a weak passive man. Abe lost his job, bought a little mom-and-pop store; then he lost the store. Unable to support itself, the family broke up. My dad and his young brother went to live with a cousin. “Aunt” Sylive was mean. She was bitter before the Depression and taking in my father, Edgar and his brother, young Phil, did nothing to shake the venom in her disposition. She was cruel in a daily, ordinary way. “Like how Dad?” I ask him. “Oh I don’t know,” he shrugs me off. “Like how, Dad?” I repeat the question. When he was eleven or twelve, the rage in my father, the missing of his mother, his father, filled him to the bursting point. His little brother was still young and sunny enough to adjust, but my dad began acting out. An “instigator” at school, a petty thief at home, he lasted through one or two “incidents” and then Aunt Sylvie summarily got rid of him. He found himself banished to the home of elderly grandparents in another part of town. Yes, he saw them. All that winter after school he would walk six miles through the snow to have dinner with them at Sylvie’s house. He would linger over a cup of cocoa until Sylvie asked him to leave. Then he’d walk back again alone. I look out of the window of our little seaside apartment, onto bare November trees. I picture that twelve-year-old boy walking back in the snow. “What did you feel?” I insist. “You were a child,” I tell him. He turns away. “I don’t know.” He slumps. My father looks up at me, his blue eyes magnified by thick glasses. “Okay,” he sighs. Then, as sudden as any rage, he reaches out his thick arms and pulls me toward him. Without a word he lays his head on my shoulder, as tender and guileless as a child. Holding him, I breathe in his familiar smell, coffee and cigarettes and a touch of Brylcreem. Feeling the weight of his great head, I am physically awkward, almost repelled, but when he pulls away, I instinctively tighten my hold on him. Gingerly, reluctantly, I stroke his back, his stiff har. “It’s okay, Dad,” I murmur. I look out past him at the trees, and wonder what will become of us, my father and me. I still neither trusted nor forgave him, but something deep inside me began to uncoil. That night was a first green tendril piercing through a stone wall. Others followed. In the years ahead, as our closeness developed, my life became more successful, and my father’s life grew ever more desperate. I watched, helpless, as financial worry, social isolation, and finally, a horrible disease whittled him, sucked the marrow out of him, pulled him under. I stayed close, I gave as much as I could. I buried my father in September 1991. The night before, when I left his bedside, he gave me his blessing and I gave him mine. The next morning, I walked into the hospital room to hind him dead. His head was thrown back, his eyes shut, his mouth open. It didn’t look like my dad. It looked like my dad’s body, a thing made of clay, like his statues. I touched his eyes and kissed him. His skin on my lips tasted bitter, earthen. I have often thought about the high school boys my father saw drown and the advice he gave me: “Don’t touch them. They’ll drag you under.” As in so many other instances, his advice on this matter was wrong. I did not go down into that dark vortex with my father. But neither did I let go of his embrace. 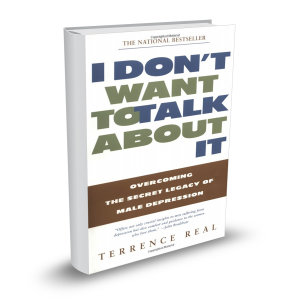 Excerpted from I Don’t Want to Talk About It by Terrence Real. Compassion is a gentle task master, empathy laser beams compassion into one’s soul. How to help grown up children heal from the already passed-on trauma that we may have inflicted on them ? Is the damage done or there is still a way to “face the flames” and stop the transmission although the children are grown ups and have already moved out? Beautiful. Last line especially. I remember the last time I saw my father alive. Accepting in his ill health and his inability to care for himself a suicide wish hiding in plain sight. I loved him. I knew there was nothing I could do about it. What work it took to see his suffering (not as my own) and release him to it – with grief and acceptance. Healing was not possible in his lifetime. But it is in mine. Thank you for your leadership and inspirational this very touching story. Thank You for sharing this, Terry. I am deeply touched. I look forward to hearing about your course on intergenerational trauma. I am in my 7th year of being a student of Thomas Hubl. My study with him is one of my truest passions. It excites me that you have a connection with him. Blessings. I read this years ago when Terry’s book first came out. His seminal work has been with me all these years as I’ve continued to study men and boys, and more recently boy babies, through Allen Schore’s work. I’m tickled to see you here, Lizzie. I, too, love Thomas Hübl and study with him, and I’m so glad he and Terry connected. I look forward to all of us finding ways to heal these intergenerational wounds, and to the day when culture re-learns how to take care of our children. incredibly moving. wish I had had the awareness to have reached out to my father in that way. He was so indecipherable and closed. He died in 2016. I was able to express to him what he meant to me growing up and I guess that will have to suffice. I know that meant a lot to him. Thank you for sharing your story, the paradox of not going under and not letting go resonates deeply with me in my family of origin story. I appreciate you putting voice to your healing and work in a vulnerable way. I am inspired to share more through your courage to do so. Many, many thanks. Terry, I have a Robert Bly poem he wrote about his father. I would like to share it with you. Where to send it? This is very important with the groups with which we are working, namely war victims in the Western Balkans and migrants, aka asylum seekers and refugees. Unfortunately, we, the Coalition for Work with Psychotrauma and Peace (CWWPP; http://www.cwwpp.org) are one of the few organizations working on such issues on a long-term bottom-up basis. Funders think that this type of work is “irrelevant”. We have gotten such comments. Yet in the time that I have been doing this work, that is, since 1988, I have seen how vital it is. We look forward to hearing more from you. As I read this I realized that my husband’s experience sounds much like your father’s. His mother left the family when he was two, his father (estranged from his own family of origin) raised two children alone until he remarried. More children came along, and things didn’t go well. My husband was kicked out as a teenager and went into foster care. He stuffed all the pain deep down, and it is only now as we have teenagers of our own that things are really starting to unravel. He sees no need for help, but I’m afraid he will pass on the broken relationships of his past. Your work, Terry, really resonates with me. Thank you! Your narrative makes me think of my father who was closed and angry and blamed everyone for the pain in his life. For many years he was the villain of my story, as his parents were the villains of his. Eventually, I was able to understand his trauma and forgive him; but it was only when I took a course in the inter-generational transmission of trauma that I understood that his parents had their own trauma, as well. Unfortunately, it was long after all of them were gone. I just wish that someone had been able to help my father understand and heal. Thanks Terry. I still remember my uncle driving me to the mental hospital when I was five years old. “Why do we have to go,” I asked. “Your father needs you,” was his reply. “What’s the matter with him?” I asked trying to hold back the tears. In our family we never talked about these kinds of things. It took my years to heal, and the process continues. I wrote about it in my book, My Distant Dad: Healing the Family Father Wound. Inter-generational trauma trauma and healing is work many of us have to do. Thanks for all the healing work you’ve done and shared over the years. “In our family we never talked about these things”…I can so relate to this comment. I remember having a conversation about my grandmother who had a child out of wedlock. It was with my sister and my parents. I just wanted to know the story about my grandmother and how she dealt with this event in her life. My mother started to cry as if we were judging our grandmother and my father stumbled through the story. They just didn’t want to talk about it! I believe it is called shame. This is powerful & so very precious. That you even had one moment with him like that is priceless. My husband are deeply grateful for your work – we got so much from your last course- that we continue to pass on to the couples & leaders we coach. I had much trauma as a child. I last saw my dad at 13 the day he left for the hospital for the last time. He died 2 weeks later. I would have given anything for an exchange like the one you had with your dad. Thank you so much sharing the work of your life with all of us. “Hero’s work” indeed Terry! Your journey speaks to mine in so many ways. Thanks for sharing both your personal story and your profound skills, which enable me to understand and continue my own Hero’s work, plus do my bit to pave the way forward for so many others. Profound articulation of the ongoing impact of emotional distance and abuse as well as the value of trying to get through relational walls. Thank you for describing so honestly how you were trying to get closer to your father and yet reluctantly held him. I became closer to my mother as an adult in my 40’s til the end of her life but still had a wall of protection up. I have felt sad at times since her passing that I needed the wall….still….after all my “work” and reading your story has helped me know I am not alone. It was hard for me to love her but I definitely showed up and continued to try. longing for the conversations that I never had. My father was also a rager and at times a bully and by the time I was in my early 20s I had cut off from him and was acting out my own rage as a 1960s radical. He tried to reach out to me, but ignored a letter he had written. He died in 1971 when I was 25 of heart failure after many years of depression. When I was about 50 and had become very interested in family of origin work I really longed for those missing conversations. With all of his largely untreated emotional problems he was also very candid and he and I would have benefited greatly from what might have been shared. Thank you for sharing this experience Terry. I can relate… having suffered both mental and physical abuse at the hands of a raging, ego-centric father. My mother was passive and enabling. As a teen I alternated between rebelliousness (which had some serious consequences), and disappearing ‘into the woodwork’… becoming invisible to his hyper-vigilant radar. Although I was able to confront him, and actually engage him on his behaviour in my 30’s, I was unable to ever fully let my guard down before his death. And now, in my 70’s, I practice forgiveness of both parents by releasing grievances… no matter how small. I wonder if it ever truly ends? Wow, Terry – Thank you. Your story was so touching and brought tears to my eyes. and how you helped him re-visit the innocent boy in himself after so long. But, I also know that unresolved pain radiates out and often hurts the hearts of those nearby… you would have also had to carry so much of that pain. I feel a lot of compassion for you both. Your sharing has brought back a similar experience with my own father but relating more to the ending you shared…. finding my father gone – he died while I was on a plane on my way to him… I had to see him in a drawer in the morgue…. his mouth open, a dark cave, void of a voice, void of life. You captured your memory so poignantly. Perhaps, I can do the same. and also how you helped him re-visit the innocent boy in himself after so long. Terry thank you as always for your wisdom, compassion and leadership in healing. Your story touches so close to my own. I just finished a family of origin paper for a class and this is so close to the bone for me right now. My own father was deeply traumatized by the death of his dad and his mother’s subsequent abandonment. We all suffered his acting out and at the age of 64 I’m still healing through the last layers. Deep blessings and many thanks. Sweet story thank you for sharing. I can relate to this although my dad never shared. He was depressed undiagnosed, only knowing from obsrevation and the same kind of unfortunate habits that I still carry with me. I did get to tell him I loved him he replied back I love you too. Never getting to the deep stuff has left me stuck. I know I dont have to stay here in this stuck place but why do I. Fear, habit and unknowing what my true potential is. I was in my 40s, and trying to make peace with my father’s neglect and abuse. One morning we were having coffee at a diner and the prior customer left the Boston Globe behind in our booth. The Globe headlines heralded the arrest of a father robert porter on massive sexual abuse charges. My father saw the headlines and became instantly sad. He went on to tell me that at age 16 he went to his parish priest with an idea to put on talent shows for the church youth. He was called back to the rectory the next day and thus began a long period of sexual abuse. He told me that what made it worse was his knowledge that the other priests in the rectory were well aware of this. He had never told anyone, even my mother about this. It happened in 1928! and to sooth these lineages of compounded pain and trauma that are very present in our daily lives.